Alternative energies spring to life. Outdoor pieces look fit for the indoors. Furniture fattens up at the Fiera. Lighting slims down at Euroluce. Brands galore reissue classics. We reveal the most thought provoking projects and comments from Milan Design Week. The stylish Ilse Crawford speaks out. Klaus Kemp inspires with the invisible. Cos reveals all about its collaboration with Snarkitecture for the Salone del Mobile. Marcel Wanders introduces Jonas Forseman. All this and more perspectives on people. Acne plays a home game. Nendo does it again. Maison Margiela gets theatrical in Milan. Lexus seduces with subtlety. Sonia Rykiel hits the books. Muti Randolph makes a light show for shoppers at Melissa. It’s the pick of the crop from the worlds of art and design. 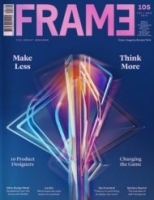 In this issue’s Frame Lab, ten designers change the game of products: make less, think more. Lee Bul draws upon the architecture of space, mind and body to construct an exceptional version of everyday reality. Herzog & d eMeuron seduces with subtlety in Tokyo, expressing Miu Miu’s deep desire for change and self-expression. The Palombas tackle wellness. Bette opens the doors of its German factory. Laufen, Duravit, Dornbracht and more get self-indulgent in today’s bathrooms. Soak up the business of sanitary design. Dutch initiative Label/Breed connect Christien Meindertsma and Enkev to conceive a biodegradable chair. In Barcelona, El Equipo Creativo’s tile-rich restaurant gives a modern twist to Mediterranean materials.